WASHINGTON — During the debate over Democrats’ push for a voting rights bill in Congress, Senate Majority Leader Mitch McConnell seized on illegal behavior by his own party in North Carolina to imply that Democrats are doing the same thing in California. This seeming contradiction was part of the fusillade of talking points that McConnell designed to publicly push back on the Democrats’ first major piece of legislation, which the House passed on March 8 but has no chance of passing the Republican-controlled Senate. The For the People Act, or H.R. 1, was intended to lay out the party’s priorities for ethics, voting rights and campaign finance reform. There is no evidence to support McConnell’s most serious accusations, but the Kentucky Republican is once again homing in on a series of arcane but important issues with big implications for election outcomes, such as campaign finance and voting rights, as he has throughout his political career. In this case, McConnell’s focus is on the collection of absentee ballots by third parties, known as “ballot harvesting,” at a time when there is an ongoing debate about the best way for states to do this. “The states are all over the map in terms of who can collect ballots from voters. States are experimenting with how to make this work,” said Wendy Weiser, director of the Democracy Program at New York University’s Brennan Center. McConnell, during the debate over the Democrats’ House Resolution 1, appeared to be for state experimentation when it benefited Republicans. He said that different decisions by states on early voting and polling place locations — areas where Republicans have been accused at the state level of suppressing minority voters — are fine. “Different states and communities have come to different, legitimate judgments on all these questions. But when it came to the issue of ballot harvesting, McConnell came out in favor of federal intervention, and was apoplectic that California has a more permissive system for collecting absentee ballots than other states. 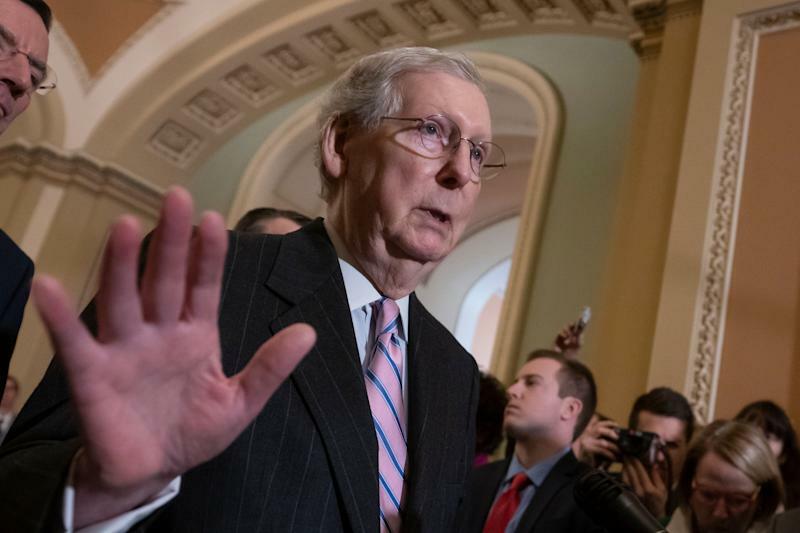 The voting rights bill “contains no effort whatsoever to crack down on ballot harvesting,” McConnell said on Feb. 26. McConnell said that the scandal in North Carolina, where a Republican operative allegedly tampered with scores of ballots he had collected from voters, could easily happen in California. “This practice makes elections a kind of scavenger hunt to see which sides' operatives can return with the most ballots in the trunks of their cars,” McConnell said. This was a subtle sleight of hand by McConnell. The North Carolina fraud would have been illegal in California as well, because Leslie McCrae Dowless Jr. didn’t just collect absentee ballots. He and others also filled in ballots and signed them illegally, according to prosecutors. California does have a liberal law on collection of ballots, and that is different from North Carolina, where only a “near relative (spouse, brother, sister, parent, grandparent, child, grandchild, mother-in-law, father-in-law, daughter-in-law, son-in-law, stepparent, stepchild or qualified legal guardian)” may deliver a ballot for someone else. There have been no cases of known fraud in California since the state Legislature passed a law in 2016 widening the range of people who can collect absentee or vote-by-mail ballots and turn them in for others. Yet McConnell insinuated that Democrats won a series of close House races in California through this new method of collecting absentee ballots. “This past election cycle turned out favorably for California Democrats. Amazingly enough, these late-arriving ballots seemed to help turn several races their way,” McConnell said. This is false, according to Mike Madrid, a veteran Republican consultant in California politics who closely studied the results. “Changes in results were the result of record high turnout on Election Day,” Madrid said. This, he said, is why some Republicans, such as Jeff Denham in the 10th District, and Mimi Walters in the 45th, saw their initial leads on Election Day evaporate as more votes were counted. In fact, many Republican campaigns in competitive districts did the same “ballot harvesting” that Democrats engaged in. Democrats just did it better, and had a more energized voter base, something acknowledged even by Republicans, who are now planning ways to improve their own ballot harvesting in future elections, according to the Washington Post. There is one aspect of the California law that has come up for nonpartisan criticism, however. “There’s no evidence that the ballot collection law was misused, even in the few reported cases when people turned in dozens of collected ballots. ... But — and this is an important but — the Democrats set themselves up for exactly these kinds of allegations when they passed what really is an overly-permissive ballot collection law,” the Los Angeles Times editorial board wrote in December. In particular, the Times recommended that California Democrats limit the number of ballots that one person can collect on behalf of others. Colorado, for example, caps the number at 10 ballots per person, to reduce the likelihood that a bad actor could collect a large number of ballots and then tamper with them. Weiser, from the Brennan Center, said she was not sure if that would be the right place to focus. “That would require study,” she said.